The truth of the matter is, there are many existing options available for farmers to adapt to climate change. However, working out which agricultural technologies work the best for certain contexts will be crucial if we are to find the most appropriate adaptation techniques and approaches for smallholder farmers. The main challenge right now is that much of the available data and information from various trial sites is usually not available to the public, while large volumes of trials data are lost due to poor data management. With this in mind, the CGIAR Research Program on Climate Change, Agriculture and Food Security (CCAFS) started an ambitious project called AgTrials in 2010. The Global Agricultural Trial Repository (AgTrials) is an information portal that gives visitors access to a database that collects and analyses the performance of various agricultural technologies under climate change in different countries. 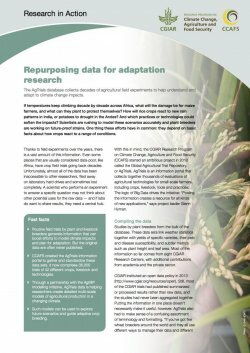 This will help further evaluate and improve agricultural production models under current and future climate conditions. The portal is also designed to help scientists evaluate agriculture technologies that work best for climate adaptation. It specifically includes agricultural technologies that would be suitable for farmers in low-income countries and builds on decades of crop variety trials that have been evaluated by scientists. Trial sites have been key in improving programs addressing issues such as drought tolerance, heat stress, pasture and livestock management, soil, water and forest management, and fisheries. The project aims to further standardize collected data and information so that it will be easier to conduct climate change analyses and multi-environment trials for the agriculture scientific community. Acquire agricultural evaluation data sets for your own research. The portal has a user-friendly web application, which helps platform managers to compile and store information on the performance of agricultural technology. The trials cover more than 20 countries across Africa, South Asia and Latin America, and includes 16 crops and 7 livestock species. It also includes raw data and their associated metadata from more than 800 trials carried out in the last three decades. Eight CGIAR Centres: the Africa Rice Center (AfricaRice), the Tropical Soil Biology and Fertility Institute of CIAT (CIAT-TSBF), the International Potato Center (CIP), the International Crops Research Institute for the Semi-Arid Tropics (ICRISAT), the International Livestock Research Institute (ILRI), the International Center for Agricultural Research in Dry Areas (ICARDA), the International Rice Research Institute (IRRI), the International Institute of Tropical Agriculture (IITA) and Bioversity (Bioversity). Local and national partners.